With increased access to computers, mobile devices and other internet-enabled technology, governments, businesses and citizens are producing more information than ever. At the forefront of the data revolution is geospatial data, which helps us generate accurate maps and is critical to achieving the Sustainable Development Goals. We often use map applications to help us get from point A to point B without a second thought, but accurate maps are not universal worldwide. So MCC recently held its first-ever mapathon at our Washington, D.C., headquarters. Mapathons are fun community events that bring people together either physically or virtually to fill in the blanks on maps using free online platforms such as OpenStreetMap. The mapathon was hosted by Data Collaboratives for Local Impact (DCLI), a program led by the Millennium Challenge Corporation (MCC) and funded by the President’s Emergency Plan for AIDS Relief (PEPFAR), to increase the capacity of country-based individuals, communities and organizations to use data that contributes to programming to fight HIV/AIDS and address other development challenges. I was part of the team that helped organize the mapathon, and we were thrilled that more than 100 people — including from MCC, the U.S. Agency for International Development (USAID), the U.S. State Department, the Data Lab, and the private sector — came together to map over 2,000 kilometers of roads and nearly 4,000 buildings in Cote d’Ivoire and Togo, two of MCC’s partner countries. This information is now public and can be used by governments, donors and investors to make better data-driven decisions when planning for critical services like health clinics, schools and utilities. Geospatial data is a tool that enables policymakers to make better decisions and is helping to achieve the Sustainable Development Goals faster and more cost effectively. 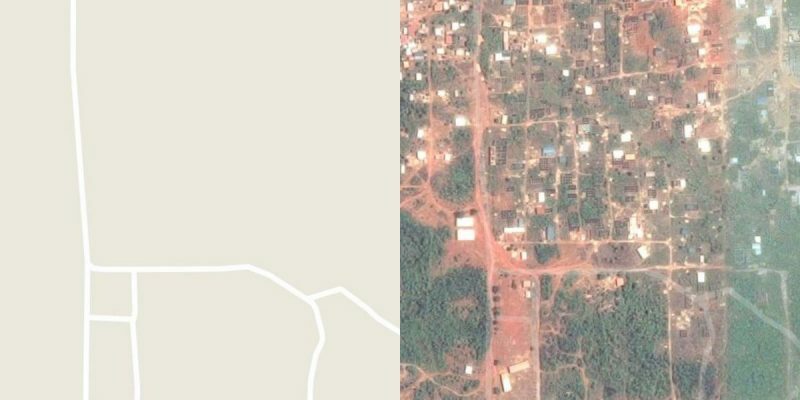 In this map of the San Pedro region of Cote d’Ivoire (left, below), for example, it is clear that information is missing compared to a satellite image of the same area (right, below). When geospatial data — information about geographic features that is tagged to a specific location — is layered with census and other information, it can be extremely valuable. It can allow us to perform more in-depth analysis of vital statistics, such as birth and mortality rates in a specific area, or track differences in education performance across communities. One of the most critical challenges for data-driven agencies like MCC and PEPFAR is to empower and enable our country partners to use the data that is available to them to enhance their program results. DCLI learned first-hand about the potential value of mapathons through our work with the Data Lab. In December 2017, the Data Lab held a mapathon that focused on Tanzanian districts where vulnerable adolescent girls and young women are susceptible to HIV infection. By improving maps, volunteers contributed directly to valuable datasets that can inform the understanding of HIV/AIDS prevalence in priority districts, as well as health facility and antiretroviral drug accessibility. Building on this momentum, most recently, DCLI — along with the Young African Leaders Initiative (YALI), YouthMappers, MapGive, USAID and PEPFAR — joined a series of mapathons held in Ghana, Kenya and South Africa to improve the effectiveness of programs supported by PEPFAR and the President’s Malaria Initiative ahead of the High-Level Meeting on Data for Development in Africa. In all, mapathon participants mapped more than 27,000 buildings and 4,200 kilometers of roads across Africa in areas with high HIV/AIDS and malaria prevalence. This series of mapathons bolstered the work of Mobilize Youth on Data for Action and Transformation in Africa (MY DATA), a network focused on directly engaging young people as champions in using data to address sustainable development challenges. Evidence-based decision-making is in MCC’s DNA and central to PEPFAR’s strategy to control and ultimately end the HIV/AIDS epidemic. Through DCLI, we are enabling country-based stakeholders to engage with our programs and support data-driven decision-making. DCLI will continue working with MCC staff and our partners to harness the power of data for sustainable development, and I look forward to more mapathons and data-related innovations to come. In the meantime, keep mapping!